Part of the show Would a Helium Balloon Float on the Moon? A breakthrough in the way laser light interacts with nerve cells could greatly improve the quality of hearing for people who require cochlea implants. A healthy inner ear contains many thousands of hair-like cells which detect sound and pass a signal on to nerve cells, which then transport the signal to the brain to be de-coded. Damage to these cells as a result of illness, accident or just genetic defects can result in deafness. A cochlear implant takes the place of these cells, communicating directly with the nerve cells so someone who was formerly deaf can hear, and presently, cochlear implants are very effective - deaf children with implants can develop speech that is very close to that of hearing children. However, cochlea implants use about 20 electrodes to connect to nerves, which is very few compared with the 3000 or more hair cells in a healthy ear - this means that an implant will certainly improve hearing, but the hearing will still be poor, and many people with implants do not enjoy music and find it difficult to converse in noisy environments. Due to the way that tissue conducts electricity, you can't just increase the number of electrodes, as they will interferre with each other and reduce the overall quality, for many years, this has put a limit on the quality of cochlear implants. But now, a team from Northwestern University in Chicago, led by Claus-Peter Richter, have announced at the Medical-Bionics conference in Victoria, Australia that they may have a way to shine some light upon the problem - infrared laser light to be precise. For reasons that are not yet fully understood - laser light will simulate neurons - even though they do not contain light-sensitive proteins. 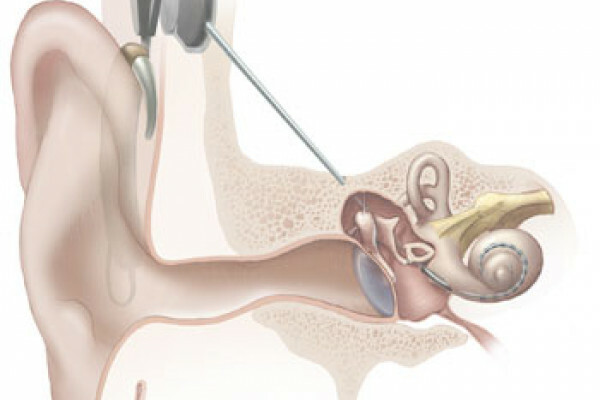 Richter's team decided to see if this would be a better way of communicating with neurons in the inner ear, and knowing that the laser would not spread through the tissue as an electric pulse would, lasers could be a way to achieve much higher definition for implants. They tested this by shining a laser of infra-red light onto the neurons in the inner ear of deaf guinea pigs, while monitoring the electrical activity in a region of the brain responsible for passing information from the ears to the brain cortex, called the inferior colliculus. Not only did the lasers register a signal which shows that the deaf guinea pigs could hear - but the brain activity was very similar to that seen in hearing guinea pigs - suggesting that implants using lasers may be able to restore hearing completely!